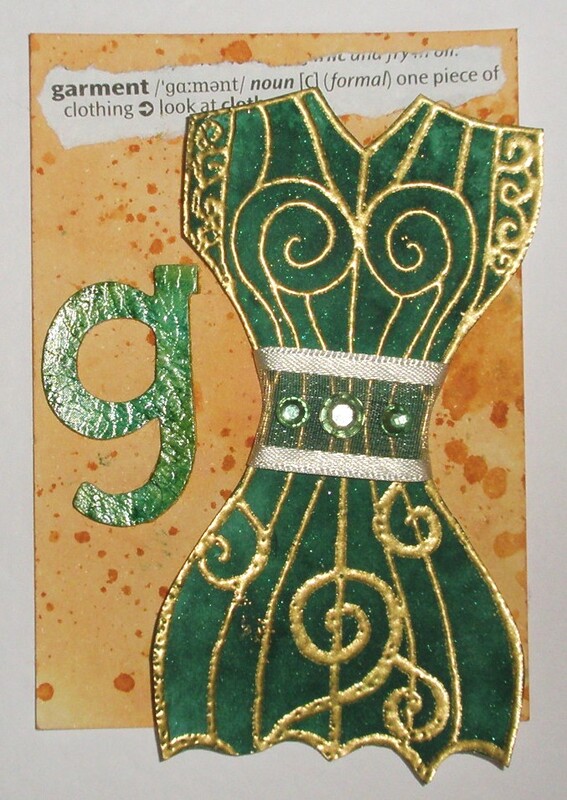 Here's my next ATC for The Craft Barn's Alpha Dictionary Challenge where the letter is G.
Quite a few choices but I've decided to do a Green and Gold Garment on a Ginger background!! The ATC base is a mix of Rusty Hinge and Old Paper Distress Inks and the Dress Form stamp (from Oak House Studio) is gold embossed (gilt) on card inked with Pine Needles Distress Ink and sprayed with Peacock Green Ink in a Bottle. I've added some ribbon with green gems for a belt, the dictionary definition and the alcohol inked vinyl thicker. Don't you think it's a glamorous and gorgeous gown! Sorry must stop using any more G words!! Thanks for looking and for all your lovely comments on my previous ATCs. Only a few more weeks left.....starting to wonder what The Craft Barn have up their sleeves for next year's challenges! Off to see what words other people have chosen! Love the Bg on this ATC. Lovely colour combo. Gorgeously great green and gold garment atc... ! Great G words on this piece. A wonderful ATC, fabulous colors. Gorgeous garment ATC. I love all your colour combinations - ginger - on this card. Beautiful stamp I hope you use it lots. Fabulous choice or rather choices Elaine, love green and gold and your ATC is fab! Beautiful interpretation of the green garment.